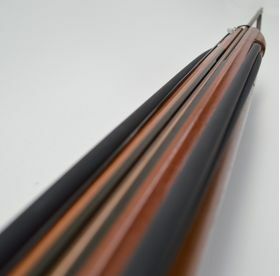 The EURO 120 is a euro style handle speargun, giving you additional reach to project your shots. The mechanism and shaft sit at the end of the speargun allowing for more band stretch giving more power. The EURO 120 speargun has 2 power bands. The EURO 120 is great for spearfishing around rock reef and coral areas in the shallows. Its shorter stock is easily maneuverable into tight spaces, like into cracks or under rocks where rock fish such as lingcod, calico, and snapper hide. This is also an excellent model for hunting fish like halibut, and white seabass in lower visibility. The teak laminate layers on the EURO 120 are laminated from side-to-side, giving the EURO 120 a wide body, with a narrow vertical build. This wide design adds weight to the speargun to decrease muzzle kick & increase accuracy. Furthermore, the sleek design offers less drag while tracking the fish. The spear track is a 3/4 UHMW enclosed track for increased speed and accuracy. This also allows the spearo to shorten the bands without loosing accuracy. The last 8 to 12 inches is open track for easier loading. The EURO 120 speargun uses a larger diameter spear. The spear is more durable, resisting damage from the fish bending it, or direct impact from hitting rocks. 100% Satisfaction Guarantee - Experience the difference with your new Andre Spearguns Euro 120 - 50 inch stock length, two 5/8"x22" power bands, 9/32"x54" shaft, and 18 feet effective shooting range.